Hello again my Janome friends! 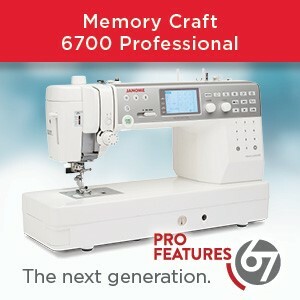 Today I am going to introduce you to the Memory Craft 500E which is a machine completely new to me and maybe to you too? I am mainly a quilter and while I have done a lot of embroidery, it was by hand. I had only seen embroidery machines stitching out at quilt shows as though by magic. They seemed slightly intimidating and I was not sure that it would be something for me. Then I had the chance to try one out on my own. This is the first of what I hope will be more blog posts showing you what a machine like the Memory Craft 500E can do. Hope you come along and enjoy what we learn together! So first… the box. Honestly it is pretty huge and intimidating. But let’s move past that and get her out and see what she is all about. Quite the machine I think you will agree! I am sensing huge potential here, but let’s not get ahead of ourselves. She comes with 4 embroidery hoops: 7.9″ x 11″, 7.9″ x 7.9″, 5.5″ x 7.9″ and 5.5″ x 5.5″… so basically two rectangular and two square at very generous sizes. Let’s choose a thread colour, one to start… say this Janome red, and thread her up. Pick a hoop size, I am going to start with the 7.9 x 7.9″. Take the hoop, open it up, add a simple quilt sandwich of fabric, batting, fabric. As a quilter this is my comfort zone, but of course there are many other fabrics that you can embroider on. It can be a little tricky to get the hoop closed but once you get the hang of it, you will be on your way! 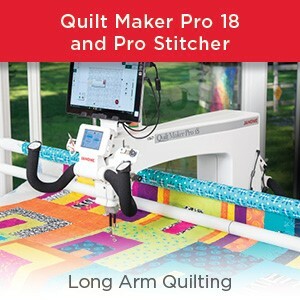 ALternatively, you could try out the optional 500E Acufil Quilting kit which has a hoop and magnets specifically designed to clamp the quilt rather than squeeze it into a regular hoop. Wow! Pretty good for my first try… I need to get some snips to tidy things up. how cute would a machine mat with all your social media handles on it be??? OK that was not so bad at all! Now to peruse Pinterest for all the potential stitching designs available… I will say this in advance, there are a lot! 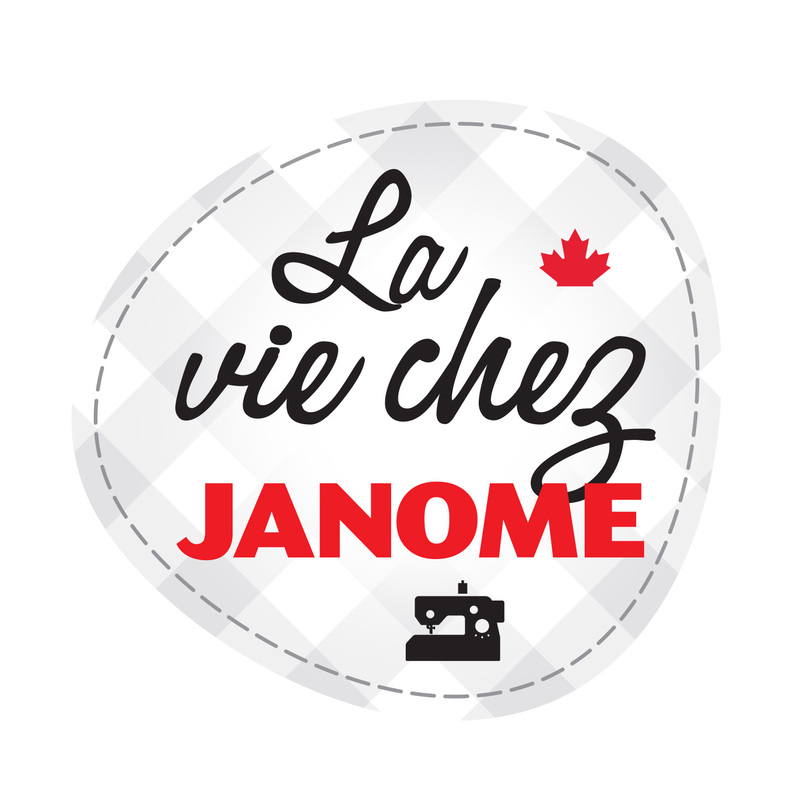 If you are planning on purchasing a pattern for download, below is a link to what you need to know about Janome embroidery formats. I will discuss this more in a future post, but until then, explore some simple designs built into the machine and dream of all the things that you and your Memory Craft 500E can make together! This entry was posted in Janome 500E, Janome Embroidery and tagged Embroidery, embroidery format, embroidery formats, embroidery machines, introduction to machine embroidery, JANOME MC500E, Janome MC500E embroidery machine, MACHINE EMBROIDERY WITH JANOME, MC500E. Bookmark the permalink. Indeed we will be sharing more. This was just a start from gingerquilter. You can do a search for MC500E on both http://www.janome.ca as well as in the search box on janomelife where we have offered many posts previously – at least 15-20 posts over the time since this machine was launched. You are also more than welcome to tell us of specific topics you might wish us to address that we have maybe not already done. And your local Janome dealer is always a great source of information too. 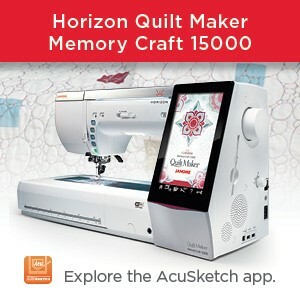 As a quilter and a machine embroiderer (500e), I think you are perhaps not giving the easiest introduction to the machine. Hooping quilting layers is VERY difficult. It’s generally not recommended, as the layers tend to pop out of the hoop way too easily. I don’t think it’s the best way to introduce a lovely machine. Beginners would find embroidery using normal quilting cotton and an appropriate stabiliser a nice way to begin. You can embroider on a quilt, by using a floating technique, but not the place to begin. Thank you for your input. We have addressed in previous posts (and will in future posts) address these points. I know we have featured the Acufil Quilting kit for 500E – for instance – which is, of course, better suited for quilting-in-the-hoop and which she does mention. I think, in all fairness to the writer of the post, she is just starting out with embroidery and made no secret of that fact. I think many people will identify with her journey of discovery. She was not showing how to quilt, just how to do a simple embroidery – her instagram handle. I think she was using a quilt sandwich as her base/stabilizer – which is doable. Probably not the easiest to hoop and, yes, she could float the fabric above the hoop and baste it in place but I think we will cut her some slack as she is right at the beginning of her embroidery journey and she will share more about what she learns as she goes.